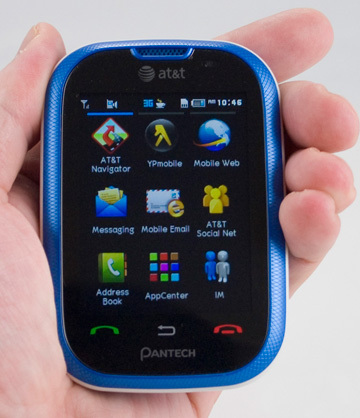 AT&T's new quick messaging phone, the Pantech Pursuit, is an adorable little feature phone with a few cool gimmicks on board to set it apart. If smartphones seem too old, stodgy and business-like for you, an adorable phone like the Pantech Pursuit is probably a better fit. With a touchscreen, social networking features and a few surprises, the Pursuit won't leave you feeling out of touch, but it won't fulfill every need, either. That's okay, because for the right crowd, the Pursuit will get by on its looks alone. The Pantech Ease is a simple messaging device with an interface and features that are easier to use for an older audience. I always get laughed at for using that word... my friends and I used it all the time back in Michigan but here in Missouri I am the only one using the word. Philip Berne, you are a great addition to the Phonescoop team, you bring balance to the trifecta. There's Rich Brome (wiki) knows more about phones than I know about my wife, Eric Zeman(the NewsMan) and now Philip Berne (making phone reviews fun). I have been a visitor for a long time, but just recently became a member. Thanks a lot! I appreciate that. I joined a great team, for sure. Can't you just upload pictures to facebook as mms? I've never had an at&t phone, but this works great with my vzw and sprint phones... And no data needed! ...a word or two about what type of browser is loaded on the phone? Just so we know to avoid it in other handsets. The browser is the Access Netfront browser, version 3.5. It's a very common browser in feature phones. Access sells it pretty cheap. I've never had a good experience with it. Opera Mini is a much better choice for phones in this class, I think.